My husband and I just returned from a wonderful week in New Orleans. Visiting New Orleans means you’re going to eat well and have a great time. We definitely ate well on this trip, though I suspect I consumed more butter in 5 days than I do in five months. New Orleans cuisine is far from dietetic or healthy, but just fine for vacation indulgence. Until recently, New Orleans was a difficult place to have any dietary restrictions. Vegetarians are relegated to ethnic restaurants and salads. There seemed to be little awareness of food allergies or restrictions in wait staff. I’ve been puzzled by the ignorance about food sensitivities–New Orleans’ only real industry is tourism, and people with food sensitivities travel. When I was researching places to eat for this trip I was pleasantly surprised by a reasonably long list of gluten-free friendly restaurants. I think it’s safe to assume that any restaurant that is taking steps to protect it’s gluten-free customers will also do a good job with other sensitivities. 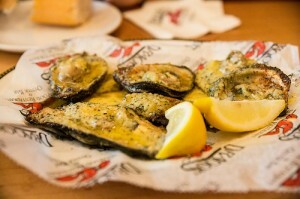 We enjoyed several meals at Drago’s, whose main claim to fame is charbroiled oysters. Oysters are every day food in New Orleans, and they’re eaten raw or cooked. Drago’s invented charbroiled oysters, and now they’re available all over the city. I’ve eaten them in a variety of restaurants and I have to say that Drago’s might be the best. They are extremely rich, and though we don’t usually eat such rich food, I think we had charbroiled oysters almost every day of our trip. Drago’s has a gluten-free menu, and the waitstaff at their riverside location was knowledgable and helpful. If you are gluten-free and want to try the charbroiled oysters, make sure to order them without the bread. We also had a delightful and low-key meal at Carmo’s. Carmo’s calls itself a “tropical cafe,” and their menu includes things like plantains and quinoa. Their menu indicates which items are vegan, vegetarian and gluten-free. This is definitely not classic New Orleans cuisine, but a refreshing, light break from all the butter and cream sauces. I enjoyed their nourishing Esmeralda salad, made of black beans and quinoa. No trip to New Orleans would be complete without fried seafood at Casamento’s and West African cuisine at Bennachin, which I’ve blogged about before. Bennachin doesn’t seem to have a web page, but they are on facebook. It’s a great restaurant for vegetarians and people with food sensitivities, and it’s a nice break from heavy New Orleans cuisine for everyone else. 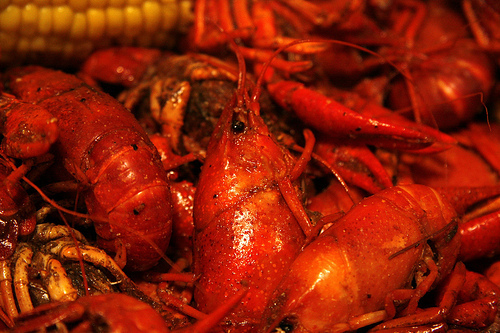 Crawfish season is in full swing right now, so we did our part to eat as many as possible. One of our best meals on this trip was boiled crawfish and shrimp (along with some potatoes boiled in the spicy crawfish boil). We picked them up at Big Fisherman seafood on Magazine St., and took them to the riverside park that the locals call “the Fly.” for a wonderful and messy picnic. We tried to do enough walking to balance out all the rich foods, but I also made sure to get a yoga class in at Reyn Studios in the CBD/Warehouse district. It’s reasonably close to many of the major hotels, so it’s easy to get your yoga fix if you’re vacationing there. The space is beautiful, and the owner, Reyn, taught a great class. The Palace Cafe, a fine dining restaurant with a separate gluten-free menu. Satsuma Cafe–a small cafe with experience serving GF customers. Truburgers, which offers a GF bun for it’s burgers. La Petite Grocery, like many nice restaurants, is said to have a knowledgeable staff to assist diners with food sensitivities. Crawfish photo CC licensed by adie reed. Oysters photo CC licensed by K Tao. New Orleans is for food lovers! Our annual holiday trip to New Orleans to visit my family is always a big food-fest. Like anyone visiting New Orleans, we do our best to eat as much of the wonderful local cuisine as we can. I should point out that though this is a health blog, I would not call New Orleans cuisine “healthy” It’s full of butter and cream and lots of fried things. So, occasional indulgence is o.k., but we always have to “detox” with lots of fresh veg and brown rice when we come back to Boston! We had a fantastic meal of raw oysters and perfectly fried seafood at Casamento’s on Magazine St. in the Garden District. This is definitely an old-school, family-run restaurant. They aren’t open every day, and don’t serve both lunch and dinner every day. If you go, you should plan to wait at least 30-45 minutes for a table as the place is tiny and no one (employees or customers) is in a hurry. We found the wait worth it–the oysters were amazing and came with a set up to make your own cocktail sauce with Ketchup, horseradish, tabasco and a lemon wedge. My husband and I shared a fried seafood platter that had fried shrimp, oysters, catfish, and crab claws. It was probably some of the best fried food I’ve ever eaten–it was completely grease-less, and almost seemed light! For those of you avoiding gluten in your diet, please check Casamento’s out! Their fried seafood is gluten-free, though you should be sure to ask them to leave the bread off of the plate. We also ate at Deanie’s seafood in the French Quarter and had grilled oysters and blackened redfish (both also gluten-free). Sadly, crawfish were not in season when we visited, but we made sure to eat as many boiled shrimp as we could on this trip. In New Orleans, we boil our seafood whole (that’s with the head and tail intact), and we like it spicy. If you’re lucky, you can also get some potatoes, onions or maybe corn on the cob that’s been boiled in the “crab boil,” as we call any spicy boiling mixture. Boiled seafood is another good option for people with food sensitivities as it does not contain gluten, soy or egg (or corn, unless the restaurant boils corn cobs–just ask).